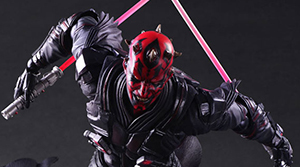 Square Enix has released new images for their upcoming Variant Play Arts Kai Darth Maul figure. Square Enix reveals full image galleries for their upcoming Variant Play Arts Kai Boba Fett and Stormtrooper figures. These two releases join Darth Vader revealed back in December. Click on through for the images and leave your thoughts on these new figures.